Exterminators and facility regulators must take great care in using pesticides. Custom signs are available to add personal messages. “Displaying pesticide warning signs on windows or doors ensure that safety protocol is being properly implemented and lives are being saved,” Daniel Male, Manager of MySafetySign.com. MySafetySign.com has launched a new line of Pesticide Signs to warn workers and passersby of chemical usage. Pesticides need to be used with caution as well as kept away from designated areas. If pesticides are used at work, pesticide signs are absolutely essential for warnings. 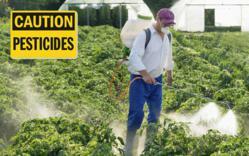 Pesticides can be the cause of poisoning or even fatalities. According to the Utah news site deseretnews.com, a high-profile case in February of 2010 involved the tragic deaths of two young girls due to pesticide abuse in Layton, Utah. Exterminator Coleman Nocks allegedly applied the rat poison Fumitoxin around the residential area, and the girls, 15 months and 4 inhaled phosphine fumes. Less than two months later, the U.S. Environmental Protection Agency banned the residential use of Fumitoxin. The Utah Department of Agriculture and Food, which regulates the use of pesticides, also tightened rules and increased accountability in the wake of deaths, one of the only positive outcomes of such a horrific incident. Since the potency of pesticides is underestimated, Pesticide Warning Signs are essential messages. Though The Pesticide Sign selection is mainly intended for the workplace, these signs can be leveraged in residential or other outdoor areas. Signs such as “Caution: Contaminated With Pesticide” or “Notice: Pesticide Use Only” alert others to steer clear of areas that have been sprayed. Additionally, signs that demarcate pesticide storage areas require using proper personal protective equipment. The selection provides signage for all pesticide application purposes. Keep Out Pesticides are warnings, Pesticide Storage areas mark chemicals, and also Poison and Pesticide Warning Signs, Tags, and Labels can be utilized to indicate a variety of safety precautions and chemicals. Custom templates are outlets for adding personalized messages about pesticide control. For more information, visit http://www.mysafetysign.com/Safety-Signs/Pesticide-Hazard-Signs.aspx. MySafetySign is the Web’s largest store for safety signage. The company’s mission is to make signs and labels as effective as possible in order to prevent accidents and save lives. Customers can choose from over 40,000 designs and customizable templates. SmartSign is one of America's fastest-growing e-commerce companies and parent of MySafetySign.com, MyParkingSign.com, as well as more than 50 other sites. The company manufactures and distributes a wide range of signs, tags, mats, and labels. In the past, many consumers have found it hard to find, hard to design and hard to order signs with the right message. By positioning "signs as solutions," SmartSign has taken an entirely different approach. Through highly targeted, content-rich, and authoritative retail sites, the company provides specific solutions to specific problems, such as keeping workplaces safe. SmartSign is widely recognized for its quality construction; its signs come with a 3M® warranty and outlast fast-fading, ink-jet signs.